Inspired five years ago to help residents save on their energy bills while building the local economy, Milwaukee, Wis., has since become one of the surprising U.S. cities to lead the way in solar installations. The municipality created Milwaukee Shines, a unique network of programs to make solar energy accessible to area residents and businesses. For that effort, it was recognized as a Solar America City as early as 2008. Despite Wisconsin’s snowy winters, the state has great potential benefit from solar energy. In fact, with the dryer, colder air of winter, more sunlight is able to reach solar panels. Additionally, all that Midwestern snow acts as a reflector and directs sunlight onto the panels. 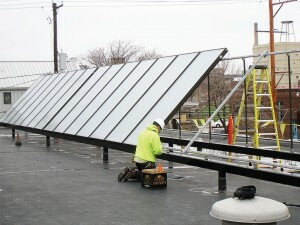 The Milwaukee Shines program promotes the use of solar by educating residents and businesses about solar energy and streamlining permitting and financing. It has already brought many well-paying jobs to the area through its promotion of the industry and has boosted local industry by pulling talent from local installers. Of course, solar energy is only part of the solution to building an energy-independent city. Complementing it is the Milwaukee Energy Efficiency program, a federally funded program that works to make energy efficiency accessible to businesses and homeowners. The program provides free evaluations, financing plans and cash-back incentives to home and business owners. After initial consultations, participants are partnered with an energy advocate to guide them through the improvements and make sure they receive all possible financial incentives. Since its creation in 2010, Me2 has helped improve more than 720 homes and 130 businesses. One beer giant knew exactly where to turn when it decided to install a solar water heating system to reduce the high cost of energy in the brewing process. 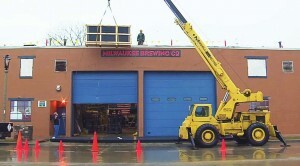 Milwaukee Brewing Co. had already taken steps to reduce its energy footprint by processing the entire brewing-to-bottling operation on-site, even sourcing local hops and packaging suppliers; however, one big area for improvement remained: the large hot-water load involved in beer brewing’s multiple processing steps. Even though the brewery had already modified one of its two boilers to burn waste vegetable oil from local restaurants and installed heat recovery systems from refrigeration systems, most of the 1,500 gallons of process water it uses every day was still being heated with natural gas. The brewery decided to free itself from the expense and environmental impact of natural gas by turning to solar water heating. Unlike more common solar photovoltaic systems, which are designed to generate electricity, solar water heating uses the sun’s energy to heat the water directly — much the way a car gets hot while sitting under the sun. Solar hot water for food production applications, such as beer brewing, are designated by the solar industry as solar heat for industrial processes, or simply process heating. One of the most effective uses of process heating is in the food and beverage industry. Once a solar heating system is installed it begins to save on the cost of energy right away. Research by Eneref Institute found that a well-designed solar heating system can operate successfully for 30 years — well beyond the time needed to pay for the system. “For processes with a large hot-water load, solar water heating is one of the best investments a manufacturer can make,” explained Seth Warren Rose, founding director of Eneref Institute. Wisconsin and the city of Milwaukee were eager to help Milwaukee Brewing Co.’s dreams come true. Wisconsin has already been able to convert 7.4 percent of its electricity generation to renewable sources. Milwaukee Brewing Company’s green credentials made it a great candidate for such a prominent project, and the brewery’s popular tours would guarantee an audience for the solar heating technology. To help fund the installation, Milwaukee Brewing Co. received $50,000 in grants from Me² and Milwaukee Shines. Additionally, it received two competitive grants from Wisconsin’s Focus On Energy program to finance the project, as well as a grant from the Wisconsin State Energy Office as part of its program to encourage breweries to become more sustainable. The project wasn’t just locally supported — it was locally sourced. The project’s design, manufacturing and installation came almost entirely from Wisconsin companies. Wolk is a research fellow with Eneref Institute, an advocacy organization for sustainable development.